A suicide attack has killed 10 people, including two policemen, in the southern Afghan province of Helmand. The attack in Musa Qala district also wounded more than 20 people, provincial police chief Asadullah Shairzad said. The suicide bomber targeted a police vehicle in a crowded market and detonated his explosives, he said. Helmand is a Taleban stronghold. 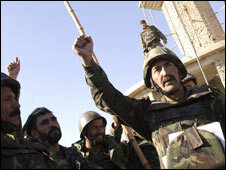 It is also the base for a large number of international and Afghan troops who are fighting the militants. Police said at least six children were among the wounded. The chief of police told the BBC that the attackers were the enemies of Afghanistan. He accused them of hiding among civilians and killing innocent people. The Taleban said they carried out the attack but insisted all the dead were policemen. Taleban militants overran Musa Qala in February 2007 and held it until a massive US-British-Afghan operation dislodged them in December last year. The town remains surrounded by the Taleban and the Afghan government has little control over the area. In a separate attack, gunmen shot dead a district governor in Ghazni province, south of the capital, Kabul. Officials said the governor, Abdul Rahim Desiwal, was shot as he left home. The gunmen fled the scene after the shooting, officials said. Mr Desiwal's bodyguard was also wounded in the attack.